Vertical Vegetables: Simple Projects that Deliver More Yield in Less Space by Amy Andrychowicz ($24.95 Cool Springs Press) is a new book that will be valuable for all vegetable gardeners who never have enough room. As I read the book I saw ways space could be saved at the same time that creative techniques would also add new beauty to the garden. This book would be a great holiday gift for those who garden in limited space. Most of us have some experience with the various supports that are used in the garden. What are the ways to support vertical vegetables? Trellises are great for vining plants and staking is used for vegetables that don’t twine. Nowadays there are also cages that circle and support a plant like tomatoes. Andrychowicz also talks about the ways plants can be trained on vertical supports. She goes beyond and describes the ways that the many varieties of container gardening can be used vertically. The list continues with vertical vegetable plantings on teepees, pergolas, arches, obelisks, A-frames and lean-tos, words not always used for supporting floppy plants. One of the latest ideas in limited space gardening is the hanging garden. The kind of vertical supports you need will depend on the plants you want to grow with regard to strength, height, and access to the harvest. Happily, vertical supports can be made of many materials, wood, wire, and pipes, depending on the strength needed and your budget. The next section of the book expands on the kind of supports that specific vegetables need from peas and beans, to grapes and hardy kiwis, to melons and then non-climbing plants like lettuce! I was surprised to see that strawberries could be grown in a hanging garden. Of course, gardeners must always consider how to fertilize, control weeds, disease and insects and Andychowicz has advice on those issues as well. Amy Andrychowicz has been busy at her desk as well as in her garden. 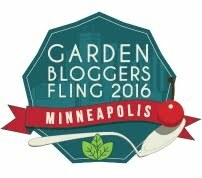 She created the Get Busy Gardening website where she has been blogging for nearly10 years. The website is full of information about plant propagation, houseplant care, projects for the garden and more. While some gardeners struggle with limited space, some gardeners, and some of our friends who have never gardened, have no outdoor space at all. The gift of a flowering plant is especially delightful and welcome at this time of the year when the days are so short. The problem is that while welcoming a blooming orchid, or cyclamen or poinsettia the recipient might enjoy it, and then weep when it shrivels up and dies. I have always thought that a book about houseplants should accompany the gift of a plant. There are many reasons that a houseplant might wilt and fail. Perhaps the amount of light was wrong, too much or too little. Perhaps the plant received too much or too little water. Perhaps the temperature was too high or too low. These are all problems that can be easily corrected if the plant recipient is given some basic information. In fact, I think giving plants to a relative or friend you should to take into consideration the type of living space, how much heat there is at night and during the day. Also think about window alignment; will there be south or north light, or east or west. There are many books that could accompany the gift of a plant. I like the encyclopedic Complete Houseplant Survival Manual: Essential Know-how for Keeping (Not Killing!) more than 160 Indoor Plants by Barbara Pleasant (Storey $24.95.) Not all houseplants bloom, even part of the year, but a bit of grape ivy, a fern, or a variegated creeping fig can also bring a whiff of the natural world into the house. In addition to a photo and a page of specific information about the needs of a plant, Pleasant has a section on general houseplant care. She gives great information about containers, pruning, repotting and dealing with specific pests that are likely to make a try at your beautiful plant. Pleasant has written other books for the novice and is an experienced gardener. Check out The Home Grown Pantry. If a big book like Pleasant’s is Too Much, for the recipient Tovah Martin’s The Indestructible Houseplant: 200 Beautiful Plants That Everyone Can Grow (Timber Press $22.95) might be the perfect alternative. Martin takes us on a tour of tough plants from African violets to the ZZ (Zamioculocas zamiifolia) plant. This book has wonderful photographs of plants and containers. Martin’s advice about care includes light needs, temperature tolerations and growth rate. She also gives good advice about creative and beautiful ways to pot up a plant. I don’t know about you, but I have to confess that when I am buying gifts for my nearest and dearest, I often have trouble keeping my own desires under control. Perhaps you’ll find a houseplant for yourself while choosing one for a friend or relative. Perhaps you’ll want to splurge on a little book for yourself, too. Happy holidays!